Local independent cinema is undergoing a rennaisance. Since the advent of the digital video camera, Every kid with a computer and a DV cam is starting to produce and shoot their own movies. Now all we need to do is sort out the bad ones and watch the inspired, well produced ones.. Recently, local movies have been earning dimes and quarters and sadly, there are no signs of improvement, while we quietly anticipate the new Harry Potter movie, they give us Enteng Kabisote 2. I can hardly contain my excitement. Consquently, Filipino independent cinema remains the only faint glimmer of hope in a dying industry. I was willing to do my part. I was very, very hesitant at first. To be frank, gay-themed movies aren't exactly my cup of tea. I was extremely pleased that the gay element was kept to a minimal (the movie is PG-13) and was not a central part of the movie. 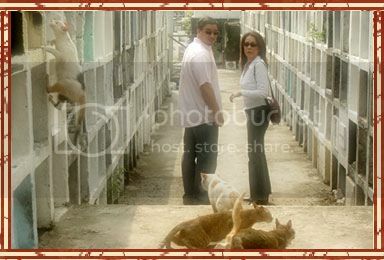 Boyet (Ricky Davao) is a pocketbook novelist with a thing for cats (the furry kind and the club-going, muscular-kind). Marta (Irma Adlawan) is and Ad exec with a boyfriend who's almost always never there. They're neighbors sharing a duplex. Boyet writes his noviels using Marta's loves and losses as an inspiration. Together they form a bizzarely symbiotic relationship as they seek that which is most important in life, this crazy thing called love. Mga Pusang Gala is an excellent story based on the play Mga Estrangero at Ang Gabi by Jun Lana (I was later told by my very informed friends that the movie was based on an original play by Jun Lana entitled Libog at Kabilugan ng Buwan). Ellen Ongkeko Marfil, the film's director had the wise judgement of not deviating from the theater-like feel of the story. Most of the story takes place in the duplex compound (which is very practical, given the story). The camera work is pretty standard at the beginning and middle parts but takes a surreal David Lynch-esque turn upon the end of the movie and paves the way to a surprisingly effective ending. Irma Adlawan definitely shines in this one. Her experience in the stage definitely reflected on her performance. Her delivery of her English dialogue brought a hint of sophistication to the budgeted production. I can say that it is one of the better deliveries of English dialogue I've seen in recent movies. It's amazzing that most of the time, even the Caucasian actors in Philippine movies dont deliver their English lines very well either. Well, they get crappy lines in the first place, anyway. The production values are understandably below par. The ad agency looks more like a P3,500 a month condo unit furnished with an iMac and some chairs. Shoot permits in Ortigas and Makati are pretty expensive. However, as the movie went by, it just got better and better, soon you focus more on the story. Yes, you get distracted now and then by some of the cheap fantasy effects (like the one with the rosebushes representing the boyfriends Steve and Dom), but soon you get engrossed with how the story will end up, you forget about it. haven't seen the film though. i'll try it on the weekend. Wow, napanood mo na! Haha buti ka pa, ako pinopromote namin hindi ko pa napapanood. filmphiler: I try to see evertything on the first day, but that's not always possible. Plus depende rin sa budget. Ei rocketboy guess your ranting the other day was answered by cats! he he he! This should have been one of the films in the festival! Astig! hey, Cinemanila is showing Belgian movies in Megamall. Next few weeks naman yung mga Cannes entries..
Strippedfighter: I liked the fact that it kept the 'commercialization' factor to a minimal. even The Colt Ice sequences were so uncommercial, heheh. If memory serves us right, baligtad 'ata. "Libog at Kabilugan ng Buwan" was the original title of the play. "Ang Estranghero at ang Gabi" was the title submitted (and won) in competition sa Palanca awards. Filmphiler, Adobo and Allan and Jane: Thank you very much, guys for the correction. It's obvious that I based all of this on the website www.pusanggala.com. But did also check it out and you guys are right. It was based on the play "Libog at Kabilugan ng Buwan" in the write ups I read in the periodicals. Salamat ulit. Of course the play was different from the SCREENplay. They normally change titles to suit certain audiences, but what the heck?! Basta, three cheers to a wonderful film! Ayos! The film takes place in the Philippines and is in a mixture of Tagalog and English. The cast is energetic and committed and the result is a fairly entertaining. Video Games Don't Really Make Us Violent? Sympathy For Lady Vengeance opens big in Korea! "Nuno Bettencourt with Near Death Experience"
"Jars of Clay: Show You Love"
San Miguel Oktoberfest Opening Night, "Is That Beer in my Hair?" Rocketboy is 28 Years Old! Michael Bay to Direct Transformers? Da Vinci Code On Set Pics!! Episode III: "The Backstroke Of The West"
Vince Vaughan Is The Answer! 'My Girl And I'...A 'Sassy' Retread? My Best Family Computer Games!